The abolition of streetcars created the need for car ownership— and traffic congestion because of the overpopulation of cars in the streets. LA Almanac pegs the number of autos in Los Angeles, a county with some 10 million people, at 6.3 million as of 2015. This number excludes the more than 1.08 million registered trucks and 164,152 motorcycles. In true car culture fashion, the California Department of Motor Vehicles allows visitors 18 years and older to drive for as long as they have a valid driver’s license issued in their respective counties. However, new residents need to apply for a California license within 10 days. Despite the heavy reliance on cars, anyone can still explore LA. 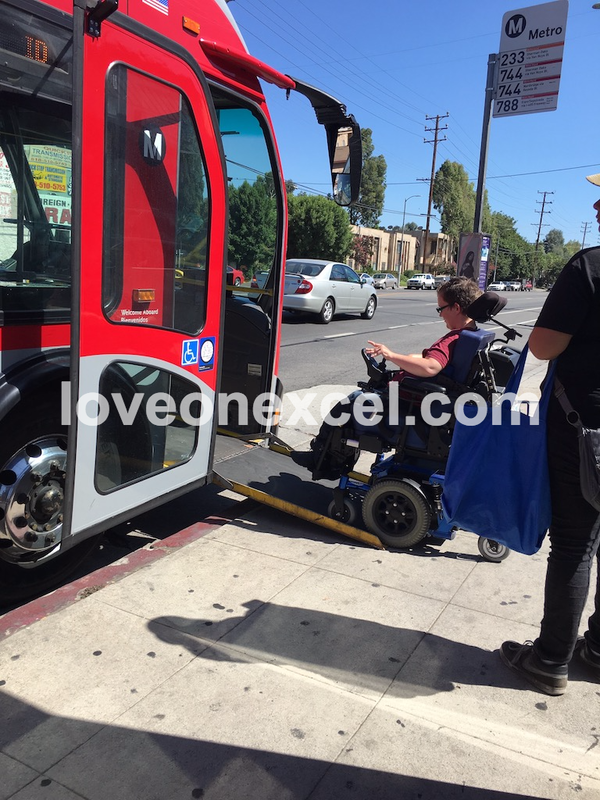 So, if you’re from a state or a country that never required you to learn how to drive, the following steps are to help you roam Los Angeles and enjoy the melting pot of cultures evident in its sites and gastronomic delights. need to take to get to your destination. First thing you must do (especially if you’re from another country) is purchase a US SIM card because this will give you internet access to make searches, download transportation apps and maps, track the movement of buses, as well as call local friends and relatives in case you get lost or miss the last trip home. Second, download the Go Metro and Metrolink apps. 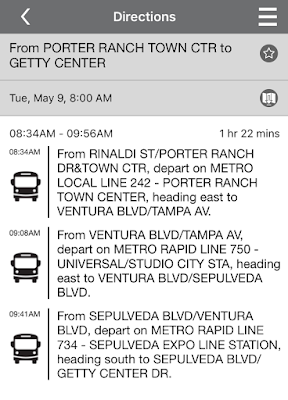 The Go Metro app helps you plot your trips and shows the real-time location and schedule of buses and trains. taking these forms of transportation usually cost more. 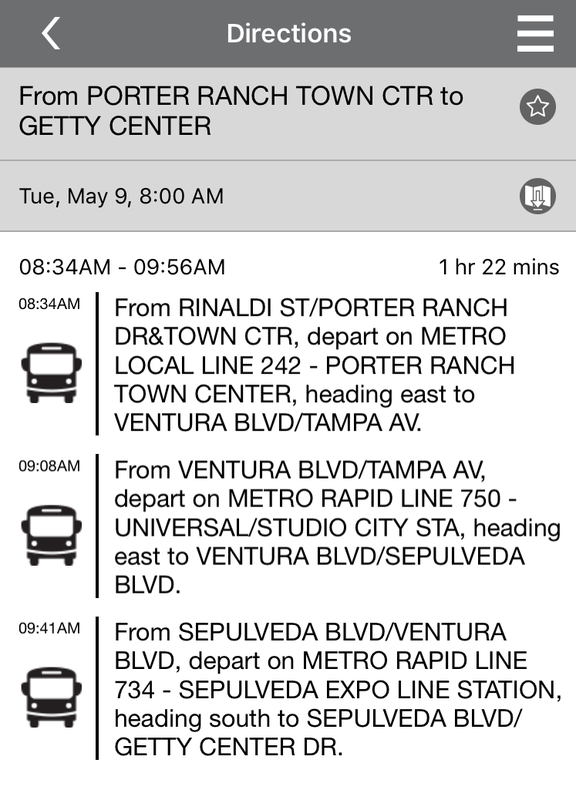 For example, a bus trip to the Getty from our place costs $1.75 while taking Uber costs $108. Waze is a driving app but you can also use it while walking. I have found Go Metro to be the most helpful among the apps. It can however be tricky to use specifically if you are in an area where there is no bus stop nearby. 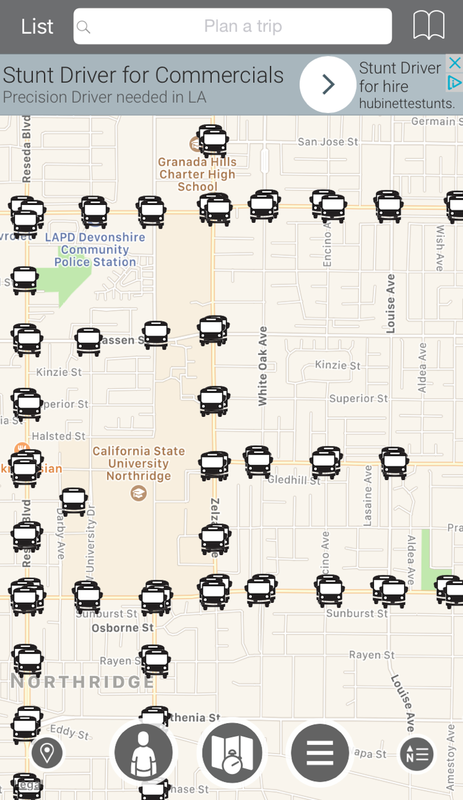 The technique is to plan a trip from an address that has an actual bus stop within 100 feet. Third, purchase a TAP (transit access pass) card. These are usually available at Metro rail stations and from vendors in your area. The card can also be ordered online but you will have to wait 7 to 10 business days to receive it by mail. 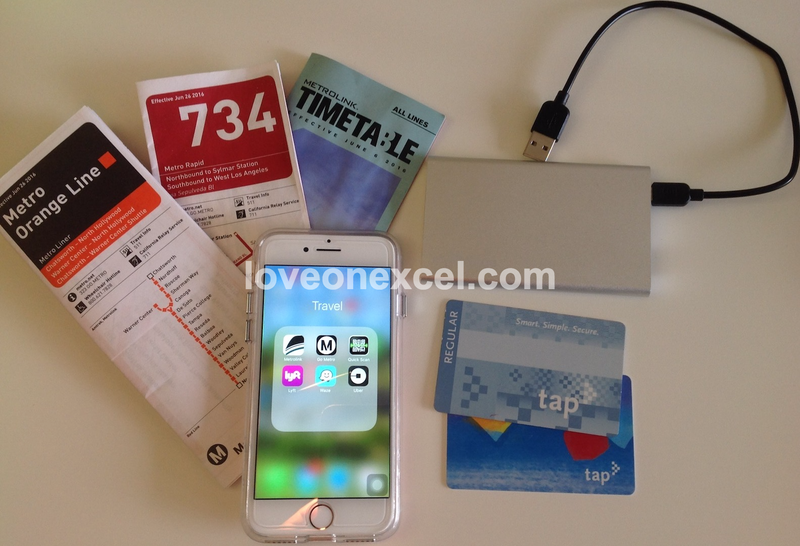 TAP card offers 7- and 30-day passes and you may pick a plan depending on your needs. I usually use the stored value option because I don’t make long daily trips. (see the bus numbers and directions on the sign post above). 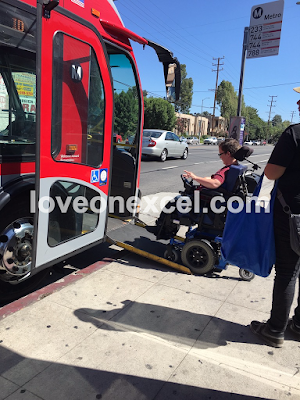 There are around 24 partner transit agencies that accept TAP card as fare payment, such as Metro, Long Beach Transit, and the Santa Monica Big Blue Bus. A TAP card is not a requirement to go around but this allows you to save with Metro because transfers (to other buses along your planned route) within two hours are free. The Metrolink app allows you to purchase tickets online 24 hours before the trip but transfers within the 2-hour period do not come free. Fourth, keep $1 bills and quarters handy. Without a tap card, you can still go around with cash. However, most buses can’t give change and only accept dollars and quarters and you don’t want to inconvenience fellow passengers. Fifth, bring a fully charged power bank so that even if your smart phone batteries run out, you can recharge and continue using travel apps. Sixth, grab a map when you get inside the bus or train so that you can monitor your stops even if the bus stop or train stop announcement system is out of order. During the first couple of times that I took the bus, the drivers were kind enough to assist me when I made a request for them to ensure that disembarked at the right stop. 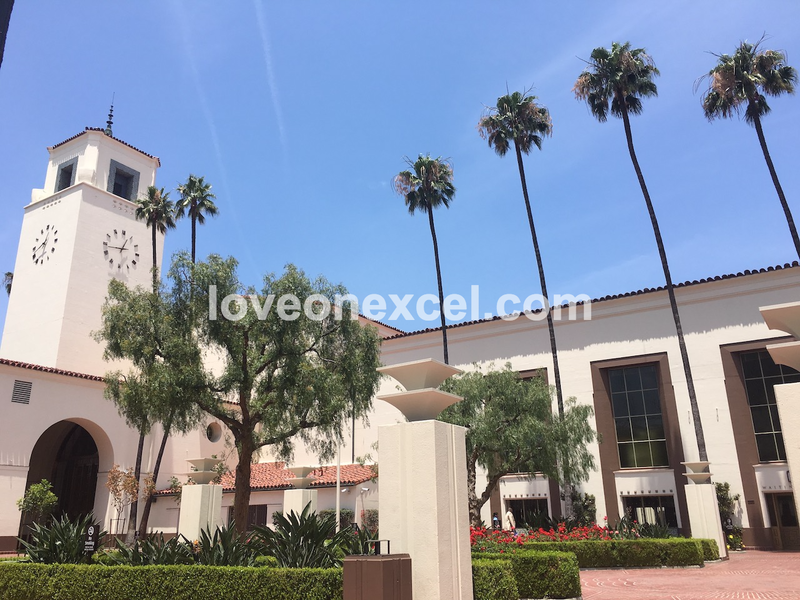 With public transportation, you familiarize yourself with historical destinations such as the LA Union Station in DTLA. Taking public transportation has major advantages and disadvantages. The greatest disadvantage about not driving is that it may take you a lot longer to get to your destination and your schedule becomes dependent on the availability of public transportation in the places that you will visit.